It’s time to gather around with friends and family to give thanks for all that has happened to us throughout the year and time to share in a feast fit for kings. If you want more out of your Thanksgiving this year, you might want to “give back” in one way or another. There are many ways that you can “give back” this Thanksgiving and I have listed a few of those for you below. 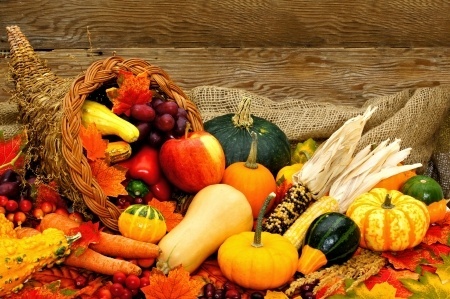 Shop for your Thanksgiving feast at your local farmers market. By shopping at your local farmers market you are helping to support local businesses and in turn that helps your local economy. Use organic foods for your Thanksgiving meal. By choosing to use organic you are not only helping your family to be as healthy as they can be, you are also helping organic farmers as well. Help out at a local food bank or soup kitchen a few hours on Thanksgiving Day. If you have children this is a great way to show your children how to help others who are less fortunate than they are. There are many other ways you can give back this holiday season and a few more ideas can be found here. Don’t forget that not everyone has as much as you do and that the holiday season is one of the best times of the year to help make a difference in someone else’s life. You may be tempted to forget about others and only think of yourself and your family during these busy holiday times but set aside a few hours each week for you and your family to help out those less fortunate and I promise that your holidays will be the best ever. A few ways you can do this are as follows. Offer to buy your elderly neighbors Thanksgiving meal for him or her. You can also offer to cook their meal to help make the big day less stressful for them. If you know that your elderly neighbor no longer has living family to spend the holidays with, invite them over to share in your families Thanksgiving feast. Trust me when I say that your Thanksgiving holiday will be the best you ever had if you are only willing to open up your heart and home to others who don’t have as much to be thankful for this year. Perhaps you know of someone who has lost a loved one this past year that you can minister to in the ways mentioned above. If you don’t have a clue where to start in your venture of giving back this season, you can start at your local church or other organizations by asking where you can best be used. Are you and your family looking for a fun way to get your Thanksgiving celebrations started in Orlando this year? Then look no farther than the Turkey Trot, this is an Orlando tradition that includes Costumes, Turkey calls, a Tot Trot and a 5 K race. There is something for everyone in the family to enjoy at this fun run! 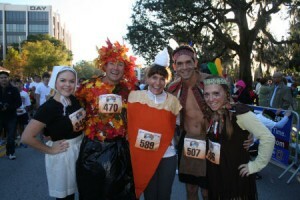 All the excitement starts at 7am with the Costume contest judging, then at 7:45am the Turkey calling judging begins. The runners hit the course at 8am, and if running isn’t your idea of a good time they need folks to cheer them on along the course! The little ones take off at 9:15 for the Tot Trot! So before you sit down to that meal of turkey, gravy, mash potatoes and pumpkin pie, get out and get moving at the Seniors First 24th Annual Turkey Trot at Lake Eola in downtown Orlando! Free mobile app to search all homes right from your phone! This information is brought to you buy Teri Isner and the Orlando Avenue Top Team. Teri Isner has distinguished herself as a leader in the Orlando real estate market. Teri assists buyers looking for Orlando real estate for sale and aggressively markets Orlando homes for sale, having become the Best Listing Agent in Orlando. You can reach Teri by filling out the online contact form or give her a call. 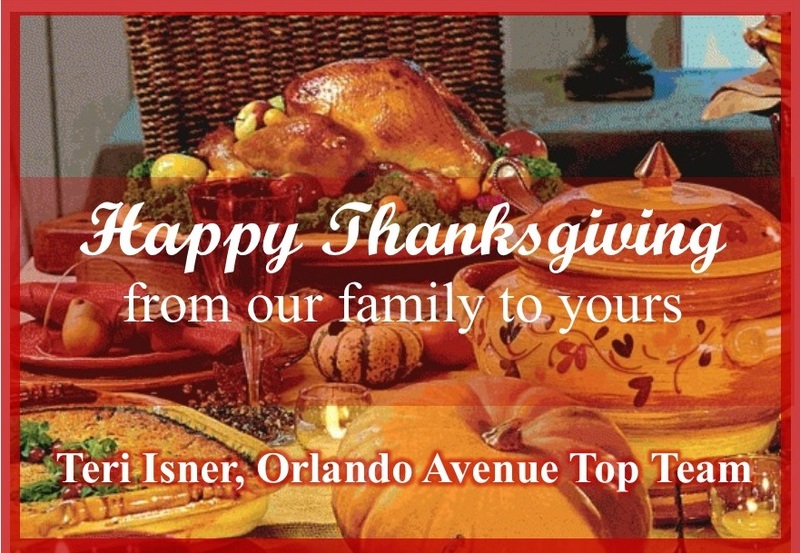 Orlando is home to many wonderful restaurants and some of them are hosting Thanksgiving dinner. So get mom out of the kitchen and take her out on the town instead. Enjoy an elegant dinner at the Ritz-Carlton’s restaurant Norman’s. They will be serving a three-course Thanksgiving dinner from 5p.m. to 9p.m. They are also having a family friendly Thanksgiving dinner at the Vineyard Grill from 12 to 9p.m. which include live entertainment. You can head down to Mount Dora and enjoy dinner at the Beauclaire Restaurant at Lakeside Inn. As you enjoy your dinner there will be live piano music for your enjoyment. Have fun this Thanksgiving with your family without having to spend all day in the kitchen cooking. Take advantage of the wonderful dining options in Orlando! This information is brought to you buy Teri Isner and the Orlando Avenue Top Team. Teri Isner has distinguished herself as a leader in the market. Although some historians claim that the first day of giving thanks in the New World was on December 4, 1619, at Berkeley Hundred in Virginia, it is commonly believed that the first actual celebration of the harvest and blessings from God took place in Plymouth in 1621. The festivities lasted three days and included feasting, entertainment, and competitions. President George Washington issued the first governmental National Thanksgiving Proclamation in 1789. In 1863, during Abraham Lincoln’s presidency, Thanksgiving became a federal holiday, and FDR, in 1939, designated the fourth Thursday in November as the official Day of Thanksgiving. Food Fact:The first Thanksgiving feast most likely did not include turkey, mashed potatoes, or pumpkin pie, but the early settlers did enjoy seafood of all kinds, seals, swans, geese, corn, turnips, and spinach. 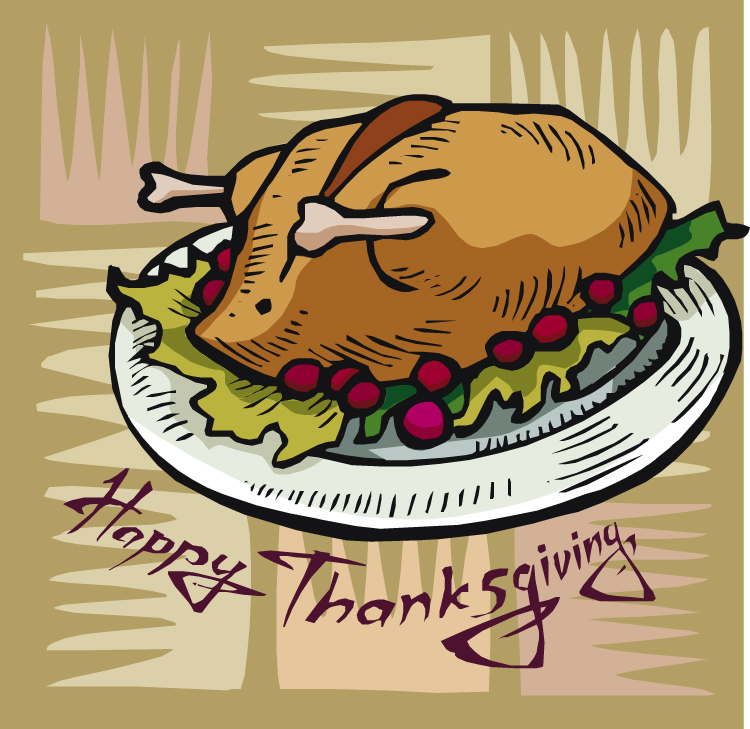 Here are some great sites for Thanksgiving recipes!! Here you will find food from the past (chestnut stuffing, mince pies), meals for the vegetarian or diabetic, healthy adaptations for old favorites, gourmet dishes, treats for kids (Daddy’s Popcorn, cheesy ranch Chex mix). Also visit the websites of Ocean Spray, M and M’s, Pepperidge Farm, and McCormicks. 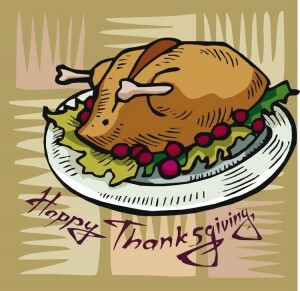 And get all your Turkey cooking questions answered at Butterball.com or call the Turkey Talk Line – 800-288-8372. “What we’re really talking about is a wonderful day set aside on the fourth Thursday of November when no one diets. I mean, why else would they call it Thanksgiving? To make basic cornbread stuffing crunchy and delicious, simply add lots of toasted pecans and moisten the mixture with sweet apple cider. You can also add liquid bacon for a smokey flavor. For extra zing, do this while softly singing, “Oh, turkey dear, oh, turkey dear, how lovely are thy feathers…” and drinking spiked hot cider punch! More tips: To calculate amount of food and drink you’ll need, follow this guide. Time required for thawing the bird: for each 4 ½ lbs. of frozen turkey, allow 24 hours of thaw time in the refrigerator. Once fully thawed, the turkey may be refrigerated for 1-2 days. And still another…Suggestions for turkey leftovers include dumplings, patties, chili, tetrazzini, barbeque, turkey/wild rice soup, turkey/ginger/apricot salad, all sorts of casseroles, and a myriad of others found at www.allrecipes.com and many, many others. If you are visiting Orlando for Thanksgiving and having Thanksgivng dinner out is more your style, you will have lots of options. 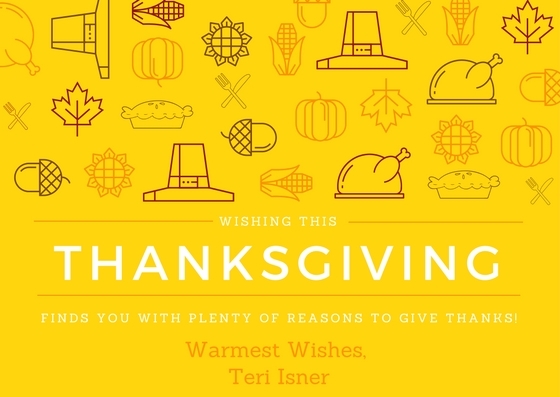 Want to share Thanksgiving greetings with friends and family? AmericanGreetings.com, BlueMountain.com, 123Greetings.com, Hallmark.com will send them out for you free of charge. And speaking of greetings–and gratitude–Xerox has a web site that lets you send a message of thanks to soldiers currently serving in Iraq. This is a FREE service and only takes a minute to do. What a great way to spread the spirit of the season! Visit LetsSayThanks.com today. 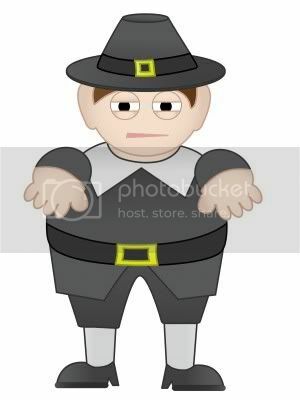 Ever feel sorry for the poor Pilgrims always dressed in drab shades? Not so, say many historians. Those early settlers used vegetable dyes to produce colorful attire, and although the colors weren’t as bright as they are today, it was not at all unusual to see clothing made of wool, linen, fur, and leather in hues of blue, green, violet, red, yellow, orange, and purple. 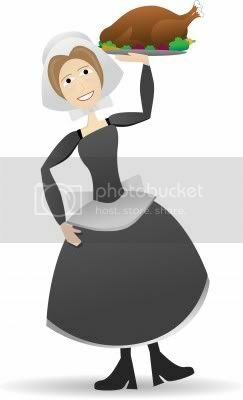 Many of the Pilgrims were skilled in clothing related trades, and they produced fashions which mirrored those of England at the time. And no buckles on shoes or hats, either–those didn’t come into style until much later. 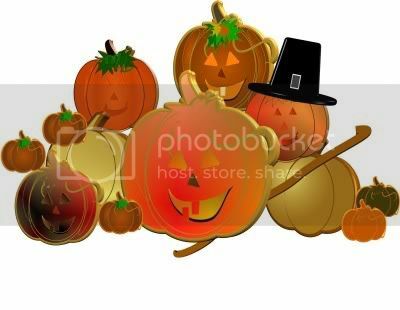 HOLIDAY DECORATIONS–EXERIOR AND INTERIORCreate a warm and thankful holiday mood by decorating your doorstep with nature’s bountiful harvest. Ears of Indian Corn, plain Wooden Wreaths, Gourds, Pine Cones, Oak Leaves, Pumpkins, a yard long Velvet Ribbons, glue. INSTRUCTIONS: Purchase a cornucopia (horn of plenty) basket and arrange pumpkins, corn, gourds, apples and nuts inside so that some of them are spilling out onto the walkway. Create garlands of autumn leaves and orange and gold Christmas lights and wrap them together around any poles or columns. Place pumpkins, stalks of Indian corn and gourds along the edges of walkways and steps. 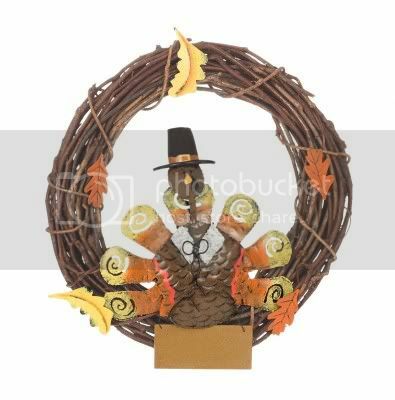 Buy a plain wooden wreath and decorate it with artificial autumn leaves, nuts, pine cones and berries. Add a fall-colored velvet bow. Hang the wreath on the door. Tie around orange and gold lights in any trees or plants near the doorway. Wrap garlands of artificial autumn leaves in the branches along with colored lights if some of your trees are bare from cold weather, Make sure none of your decorations block the peephole in your door. CAUTION: Check to make sure that your outdoor decorations are not in the direct line of your sprinklers. Directions: Cut out 2 inch by 6 inch strips from various colored construction paper. Have everyone write one thing they are thankful for on the strips. Form the strip into a circle and staple. Make sure the writing is side out! Take the second strip and stick it through the center of the first circle you made then staple. Continue doing this until you have used all your strips. 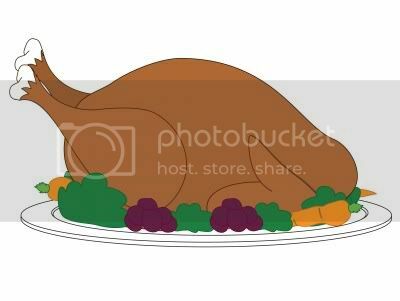 These hints–and hundreds of other craft ideas, songs, turkey jokes and one liners, and games are found here. A GREAT source of ideas!! One of the best parts of living in Orlando is Thanksgiving at Disney World! Turkeys made from paper, pine cones and gourds. 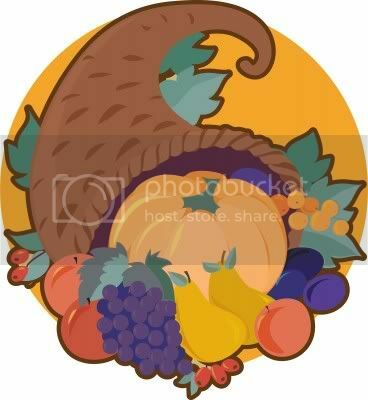 Download Thanksgiving screensavers. 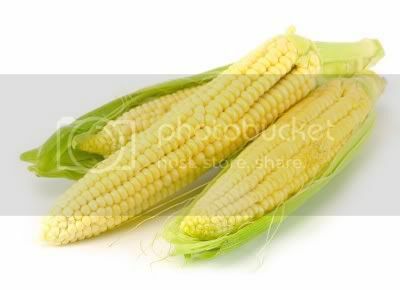 Make special Indian Corn Napkin Rings. 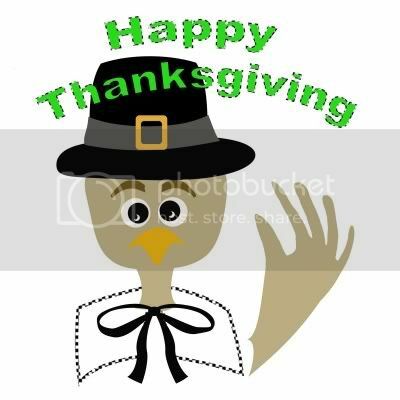 Enjoy Thanksgiving crossword puzzles, jokes, and trivia. Get kids into the Thanksgiving spirit with a festive turkey hat. Make a turkey out of yarn and paper. And dress up the fridge with Indian corn magnets. Read beautiful Thanksgiving stories, sing Thanksgiving songs, and learn about Thanksgiving around the world. Help children make the most of Thanksgiving by planning activities that become family traditions. During dinner, have everyone tell what they are most thankful for. If someone is thankful for food, plan to share a meal with someone less fortunate. If the kids are thankful for toys, collect unused or nearly new toys for a toy drive. Contribute non-perishable foodstuffs for a local food bank. Give money to local agencies who feed the hungry. Volunteer your time to sort supplies, set up and/or clean up, or serve meals on Thanksgiving Day. Invite a neighbor who lives alone to join you for dinner. Take a warm plate of Thanksgiving food–and a big smile–to a shut-in. Contribute to holiday food collection bins in grocery stores. 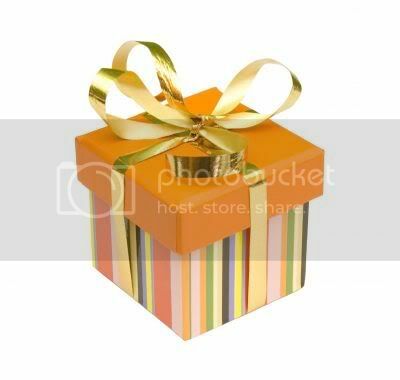 Purchase pre-packaged boxes of food (generally around $10.00) to be distributed by local grocers. Check with your local place of worship to see where your help is most needed. So there you have it–facts, myths, tips, websites, and everything you have ever wanted to know about Thanksgiving. May Orlando Thanksgiving be an enjoyable celebration shared with friends and family and filled with gratitude for all your blessings!